NEW! Updated forest land-use and change rates (deforestation and afforestation) have been calculated at global, region (continent) and ecological zone scales for 1990, 2000 and 2010. The results of the update for 1990-2010 are available here. The full report for 1990-2005, including methods, is available on-line here (PDF 2MB). New estimates of the area in forest land-use and change rates (deforestation and afforestation) have been calculated at global, region (continent) and ecological zone scales for 1990, 2000 and to 2005. FAO, its member countries and the EC Joint Research Centre and other partners have been undertaking a global remote sensing survey of forests since 2008. This survey improves the knowledge on forest land use change dynamics over time, including deforestation, afforestation and natural expansion of forests. A systematic sampling design based on each longitude and latitude intersects as illustrated below, with a reduced intensity above 60 degrees north due to the curvature of the Earth. 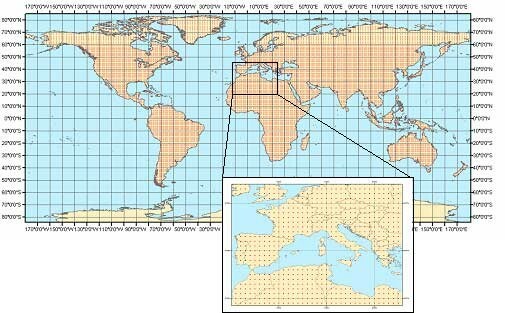 The assessment covers the whole land surface of the Earth and consists of about 13,500 samples, of which about 9,000 samples are outside deserts and areas with permanent ice. The area covered at each sample site is 10 km x 10 km, providing a sampling intensity of about 1 percent of the global land surface. This grid of sample plots is the same as used for the national forest assessments supported by FAO and by many national forest inventory programmes. A brochure on the FRA Remote Sensing Survey is available. More details of the approach are described in the FAO working paper "Global Forest Resources Assessment 2010: Options and recommendations for a global remote sensing survey of forests", also available at: www.fao.org/forestry/fra. For more information on the technical collaboration, see the FRA RSS Partners webpage.